Smooth, ultra-thin and strong, 3M™ Precision Masking Tape is excellent for critical edge paint performance, helping auto body painters produce sharp paint lines using solvent and waterborne paint systems. Its paper backing helps produce very low paint edges with enough strength to pull through layers of colour and clear coat. 3M™ Precision Masking Tape, 06525, is ideal for two-tone separation, bumper black out areas and back masking. Coated with an acrylic adhesive to provide excellent UV resistance and adhesion to metal, glass and painted surfaces. The smooth backing and even adhesion provide less chance of imprinting on freshly painted and delicate surfaces. A high performance masking tape designed to produces excellent paint lines with solvent and waterborne paints. 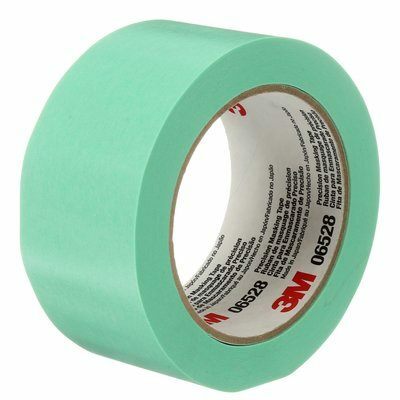 3M™ Precision Masking Tape is light green in colour and is constructed with an acrylic adhesive to provide excellent UV resistance. The unique construction provides a smooth even unwind that is easily torn by hand but yet is strong enough to pull through multiple layers of base and clear coat. The smooth backing and even adhesion allows the taping over freshly painted surfaces sooner with less chance of imprint damage.